HDR Imaging. Part of the Off The Clock tutorials for amateurs. HDR Photograph. What is that? High Dynamic Range. Take out your digital camera and take a picture looking at a light or out the window on a sunny day. What did you get? A bright window and a dark room. If you use flash it is better, but not quite right. You are out in field on a sunny day, your photos will likely balance to make the brightest spot (say a white flower in the foreground) the highest exposure with the detail blown out and no detail in the darker areas either. This is where HDR comes into play. Take three pictures. Over expose one so the darkest spots are light and visible. Another with normal exposure. And the last under expose so that the bright spots are darker and the detail shows. Now take the best of all three photos and make it one picture. That is HDR. When you look at sunny window in a dark room, you eyes adjust to the light almost instantly allowing you to see the detail in the light. Then when you glance back to the darker areas, the eye again adapts and allows you to see the detail in the room. A photograph is a frozen moment in time, it can't adjust to the extremes like the eye. HDR is a "mind's eye" photo technique. This allows a static picture to look like what we see with our dynamic eye. This may sound like something for professionals or studios, but computers and low cost digital cameras have opened the game to everyone. Many 'point-and-shoot' cameras have exposure control on them, allowing for this type of work. Most DSLRs are going to do a great job, some have automated functions to make this very easy. HDR imaging also allows for some artistic effects to achieve a 'comic look' with very over reached colors and contrasts. This example might be a bit exaggerated. This look can also be created from a single photograph by mis-adjusting the levels in a photoeditor. site to try this, practice at home. It does not matter what the subject matter is, only that the subject has a good range of color and intensities. Figure out your camera. You need to know how to change the exposure between shots. Some cameras have buttons and rotating selectors, others use soft menus. Figure yours out before you do anything else. Tripod. This can be done without one, but we are learning so lets make it easier. Using a tripod will remove a possible problem. Make sure the camera is mounted securely and the tripod is tightened up. Any movement can ruin your HDR composite, which is why we are using the tripod to start with. Aim. Take it outside on a sunny day, point it at a lamp or in your china cabinet. Chose something that is not going to move and you can try over and over again. Fire!! Try a test shot in Auto. See what you get. If you have glare and blown out parts and others that are dark, you have a great picture to play with. Take note of what the camera 'thinks' you should shoot that picture with, this will be the middle point of your series. Fire again, and again... Lock the camera settings. We don't want the aperture, focus or zoom to change. The only change we want is the exposure. picture with a longer exposure, one with the recommended, and one with a short exposure. If the camera recommended 1/200th of a second (usually shown as 200) shoot one at 60, then 200, then 640. If you need more contrast between the images change the times or shoot more pictures spread out. If you are using a semi-automatic mode choose 'A' or aperture based mode. This will keep the images stable and still change exposure times. Set your focus then disable the auto-focus. Use the exposure setting the set it as far negative as you can. Most point-n-shoots will go -3 DSLRs usually to -5. Take the first picture. 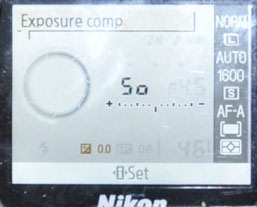 Now set the exposure to 0, shoot. Max it out positive and fire again. If you choose to get more, samples try -3,-2,-1....2,3 or what ever works for you. Load up your favorite HDR program. Photomatix has a pretty good set of HDR features. Photoshop has an automated import function to build a HDR image. Essential HDR has a FREE edition of their software. They all work more or less the same. Play with the settings see what you end up with. Seeing ghosts? Faded multiple images? Camera setting changed (zoom, aperture, focus). Make sure you stop the camera from 'thinking' and correcting you. Camera moved. Hang weight on the tripod hook. Lock all the knobs. Keep that camera steady. Glowing orbs and halos around the light source in over exposed images. Dirty filter or lens. We don't often desire hugely over exposed pictures, so you may never notice this until you try a HDR image. Follow the lens manufacture cleaning instructions. If it is just the filter, take it off and try the WHOLE shoot over again. Lack of color in the foreground. Back lit images will always have a loss of color in the foreground. You can try adding a diffused flash image into the HDR sample set. I have had good results with that. Try your series of pictures again, moving all your pictures to a higher or lower exposure. Or adjust the aperture, and shoot again. The test shot before you lock the camera settings, should be an OK picture. That is your start point. Then start low and work up to high.